Video surveillance cameras to go beyond security to help raise revenue via real-time video analysis. 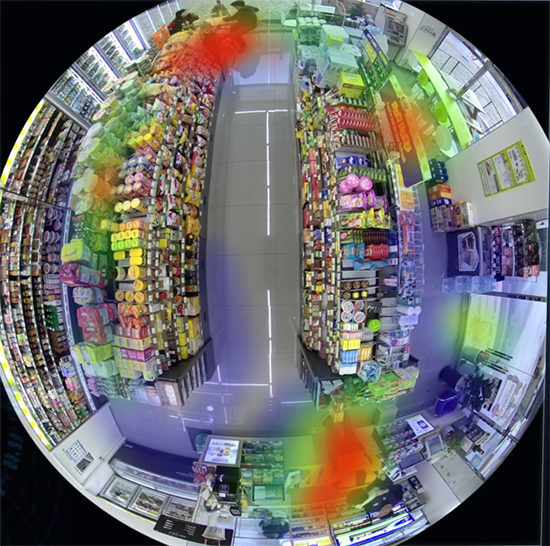 Useful for store operations such as inventory management, merchandise display, and so on through intelligent video analytics including people counting, heat map, etc. With the new face recognition technology, you can now use video surveillance cameras to help catch criminals. As the scope of smarter CCTV devices gets wider, its potential for retail marketing has become a hot issue in the industry. In general, CCTV was mostly used in retail for monitoring safety and preventing crimes. However, the emergence of intelligent CCTV has now enabled the users to analyze the recorded and live video, helping video surveillance system to go beyond its existing scope of monitoring security and safety, and help boost sales through identifying customer behaviors and purchase patterns. Global security company Hanwha Techwin offers Wisenet retail solutions that not only keep stores safe and secure through intelligent video analysis, but also help boost sales by improving stores’ operational efficiency. This exclusive solution is considered optimal for meeting the ever-changing needs of retailers. The People Counting function allows stores to know their busiest periods by analyzing the number of customer entrances by date and time; this allows efficient management of staffing and circulation. Queue Management function adjusts operations at the counter based on real-time assessment of lines at checkout to shorten customer waiting times. And the Heat Mapping function facilitates real-time inventory management by identifying popular items. These smart functions go beyond efficient store management to help devise effective marketing strategies. Additionally, through Hanwha Techwin’s integrated video management software for retail solutions ‘Wisenet SSM Retail’, customers can easily identify and manage all the CCTV cameras installed within a store. Receipt data from the POS are also saved with the video allowing for a quick follow-up to sales-related events. A Hanwha Techwin source said, "Demands by franchise and business owners to provide business intelligence data, beyond simple security functions, through retail solutions have recently been on the rise," adding, "Apart from retail, Hanwha Techwin Wisenet provides vertical solutions for a wide range of industries such as city surveillance, transportation banking and others. Hanwha Techwin strives to provide differentiated values to our users with diverse needs through constant investment and development."